The oil price oscillated between $50 and $86/b in 2018, averaging $71/b (+31% compared to 2017). The volatility observed in 2018 was due in large part to uncertainty about supply and economic growth, but also to the U.S. sanctions against Iran. Initially announced as being extremely severe, the embargo was softened at the last minute by the American president when he realized the likely consequences of a rise in the price of oil products. 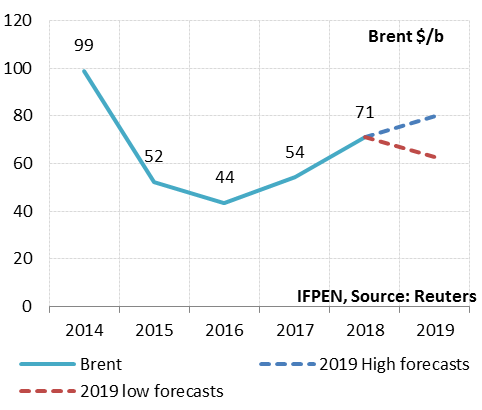 For 2019, the average Brent price is expected to be in the $60 to 80/b range. These expectations account for different scenarios for factors such as economic growth, the Iran embargo, OPEC’s management of supply and U.S. production. Based on forward prices and expected oil prices, the average UK NBP price for 2019 could fall between €19 and 23/MWh ($6.5-7.8/MBtu) compared to €23,3/MWh ($8.1/MBtu) in 2018, representing a potential decrease of between 1 and 18%. 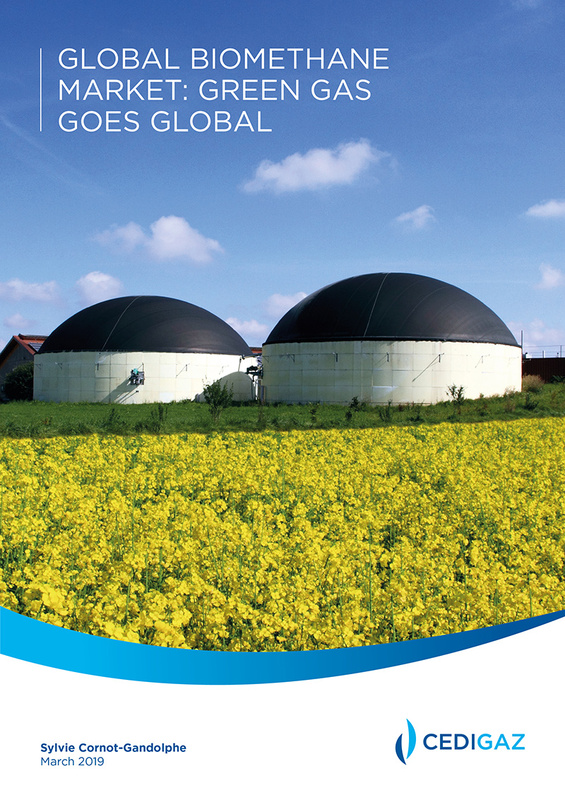 – Overall, the gas markets in Asia, Europe and the United States have been fairly volatile. In addition to the upcoming winter’s degree of severity, the oil price and economic context are also sources of uncertainty. Average prices for 2018 have been trending upwards, with the notable exception of those in the United States. – The average price of gas imports to Japan continued to rise in the third quarter, mainly influenced by the uptrend in the oil price. During Q3, LNG spot prices approached long-term prices, indicating a tightening of supply due to increasing demand in Asia. According to market forecasts, this state of affairs should persist throughout the winter, followed by a perceptible price downturn starting in the spring of 2019. – Since Q2 2018, the NBP price has been on an upward path. This trend is expected to continue throughout the winter then start a downswing in Q2 2019. Overall, it has been lower than the prices seen in Asia, a factor that does not favor LNG deliveries to the European market. – It is thought that the Henry Hub price, up slightly at the end of Q3, will continue this uptrend over the next two quarters. The latter is not considered to be structural and, for 2019, the forward markets are anticipating a lower price due to the expected increase in production. – In Asia, the average price of gas imports to Japan has risen since year-end 2017 in step with the uptrend in the oil price. LNG spot prices are under pressure and approaching those of oil-indexed contracts. – These conditions have affected the European market, where price levels for Q2 and Q3 are relatively high. – In the U.S., the Henry Hub price was lower in Q2 than Q1, due to the magnitude of U.S. natural gas output. Globally, based on current information, average 2018 prices look to be up sharply in Europe (+36%) and Asia (+30-40%), but down in the United States (-3%).